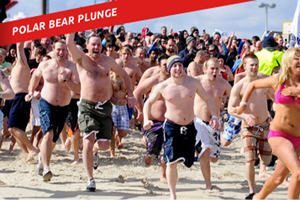 Annual Polar Bear Plunge, Saturday, February 25, 2017. Registration begins at 9 am until 12:30 pm. Plunge takes place at 1:00 pm in the ocean in front of Spicy Cantina in Seaside Heights, N.J. For more information visit www.NJPolarPlunge.org.